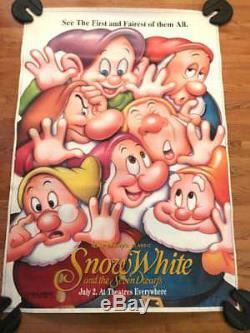 Disney Snow White and the Seven Dwarfs (R1995) 48x70 Bus Shelter Movie Poster. This is an original, vintage studio-issued, giant bus shelter movie poster for 1995 re-release of Disney's Snow White and the Seven Dwarfs (1937). It is the first full-length. Feature film and the earliest. Poster is rolled, double-sided, measures 48" x 70" and is in overall FAIR condition only due to waviness throughout. Professional linen-backing should remove the waviness and make this poster a stunning presenatation piece. Further restoration could address the few surface marks in border if you desire. These vintage oversized bus shelter size posters are becoming increasingly difficult to find. This will make a most impressive display in any home, man cave or office! An absolute must-have for any fan of the film! As most of the items we offer are COLLECTIBLE in nature, both modern and vintage, used and new old stock, we make every effort to clearly photograph and accurately describe each and every item we post. We will do our best to address your concerns, answer any questions and provide additional info if necessary. In the rare instance of an error with your order, we will always be honest, fair and reasonable and only ask that you be honest, fair and reasonable as well. The item "Disney Snow White and the Seven Dwarfs (R1995) 48x70 Bus Shelter Movie Poster" is in sale since Tuesday, March 27, 2018. This item is in the category "Entertainment Memorabilia\Movie Memorabilia\Posters\Originals-United States\1990-99".